Microsoft has released an update rollup to WMS. 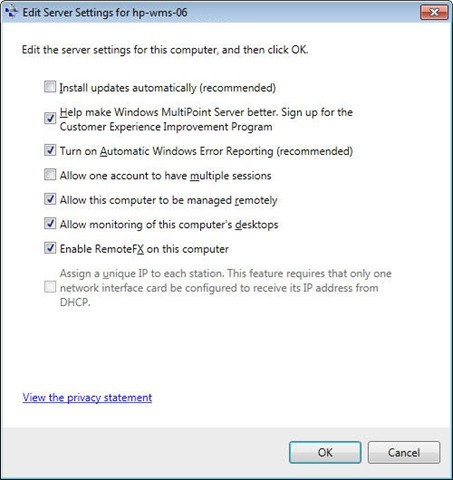 This update rollup replaces UR1, which had an installation order problem when installed on an SBS Essentials network (or with Windows Storage Server 2008 R2 Essentials). The details of the update are covered in MS KnowledgeBase article 2626067. UR1.1 is cumulative, so you can install it over the top of UR1 if you already have that installed, or you can install it on a plain RTM system. It will supersede UR1 on WU/MU/WSUS. 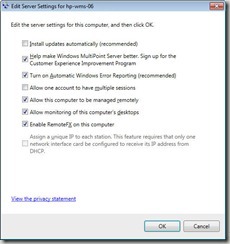 Windows MultiPoint Server 2011 (WMS) has an option to “Enable RemoteFX” under Server Settings . But what does that option actually do? And what IS RemoteFX anyway? RemoteFX is technology that was included in Windows Server 2008 R2 that is designed to make virtual machines and remote sessions work better. When used with Windows 7 VDI sessions, and with the appropriate graphical hardware, it can leverage that hardware to create a virtual GPU for the VDI session. However, that isn’t something that WMS can take advantage of. However, another piece of the RemoteFX story is an improved codec for RDP sessions, and that is something that WMS can use. The RemoteFX codec is designed to handle video and mixed video and text better across RDP sessions than the native NScodec. When you enable RemoteFX under Server Settings, WMS switches from using the NScodec to using the RemoteFX codec for encoding content that is rendered on the server and sent over the wire via RDP. To take advantage of it, however, your WMS station needs to be running RDP version 7.1, which means your client needs to be running Windows 7 SP1, Windows ThinPC, Windows 7 Embedded, or one of the third party RDP clients that are 7.1 compliant. I’ve enabled this on my WMS, and it definitely helps with streaming video to an RDP session. It won’t help to a zero USB client, unfortunately, but works well with my repurposed old laptop that is running Windows ThinPC. Finally, if you have a lot of multimedia needs for WMS, and your physical layout allows it, I suggest using directly connected video for your client stations. This is the best video solution, and with a couple of modern video cards in your WMS server you can easily get 8-10 stations directly connected. If you need more stations than that, using RemoteFX and a client running an version 7.1 compliant RDP client will provide a quite acceptable experience. The beta of the Office 365 connector (officially known as the "Office 365 Integration Module") for Windows Small Business Server 2011 Essentials is now available. See the post on the Official SBS Blog. This is still only a beta, but is now widely available. I haven't heard any news about when we will finally have a released version of this connector.